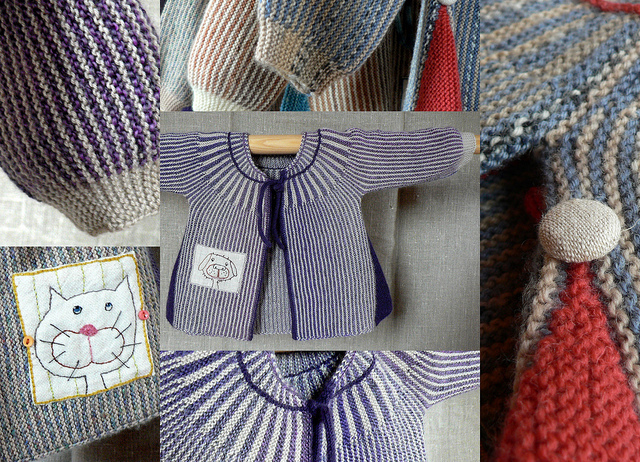 I came across the Lilleput baby cardigan by Lene Alve (Ravelry link, here) some time ago but I didn't have any reason to make it. Now I do as my daughter is pregnant and just found out that she's having a girl, due around the end of October. I can't procrastinate if I'm doing to do this project as it's only a 3-month size. It's such an adorable design and reminds me of a little swing jacket. I may even do the embroidery patch as it's a cute touch. I used to do a lot of embroidery, and enjoyed it. I'm looking forward to trying my hand at it again. Next up, choose the yarn and the three colors. Big fun! In the meantime I'm knitting socks, socks and more socks. I'll have some F.O.s to report before long. oh, how sweet is that -- but I'm not making it right now. I have other things to make, but aw, it's so cute! Right. Heading back to my regularly scheduled knitting!